Sorting Clams Dr. Eric Powell of the University of Southern Mississippi's Gulf Coast Research Lab sorts clams on the fishing vessel ESS Pursuit during an assessment of surf-clam stocks in mid-Atlantic waters. This was a cooperative effort between the commercial fishing industry, NMFS, and academic programs lead by Powell and Dr. Roger Mann of VIMS. Photo courtesy of Roger Mann. A new 5-year grant from the National Science Foundation to the Virginia Institute of Marine Science will jumpstart a partnership in which commercial anglers and other groups jointly plan—and fund—the research needed to promote sustainable fisheries throughout the Mid-Atlantic and Gulf coast region. The public-private partnership, formally known as the Science Center for Marine Fisheries, or SCeMFiS, is a cooperative venture managed by VIMS and the University of Southern Mississippi. The Center is led by Dr. Eric Powell of USM’s Gulf Coast Research Laboratory, with Professor Roger Mann directing the SCeMFiS site at VIMS. The Center’s industry partners—which the National Science Foundation defines as any private or publicly traded company, trade organization, or non-profit group—currently include the Garden State Seafood Association, the National Fisheries Institute Clam Committee, the Northeast Fisheries Science Center, Atlantic Capes Fisheries, Inc., LaMonica Fine Foods, Lunds Fisheries Inc., the National Fisheries Institute Scientific Monitoring Committee, Surfside Seafood Products, and L.D. Amory and Company of Hampton. Full partners in SCeMFiS contribute $50,000 per year for two voting seats on the Center’s Industry Advisory Board, while a $25,000 annual subscription confers status as an associate partner with a single voting seat. 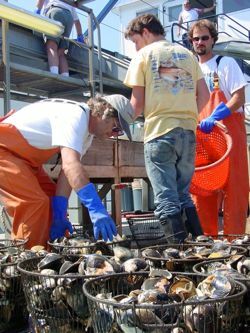 Mann says that initial areas of collaborative research will likely involve the surf clam and ocean quahog fisheries; trawl fisheries for squid, mackerel, summer flounder, black sea bass, and other species; and the purse seine fishery for menhaden. SCeMFiS is funded through the National Science Foundation’s Industry/University Cooperative Research Center program. These centers are designed to provide the business community with the opportunity to gain access to science to help fulfill their needs. NSF says the highly competitive program—in operation for more than 40 years—has become a model for collaborative research between industry and universities nationwide, with centers in fields as diverse as health care, energy and environment, cloud computing, and homeland security. Fisheries scientists at VIMS are already involved in a number of science-industry partnerships at the federal level, including the Northeast Area Monitoring and Assessment Program (NEAMAP), the Southeast Area Monitoring and Assessment Program (SEAMAP), and the Sea Scallop Research Set-Aside Program. However, says Mann, SCeMFIS and other Cooperative Research centers allow industry a greater role—and greater fiscal responsibility—in fisheries research. The National Science Foundation’s initial support of SCeMFIS comes in the form of a continuing grant in which NSF agrees to provide an initial 5-year seed grant of $529,340, with a statement of intent to provide additional future support if funds are available and results warrant. NSF officials say that investment in SCeMFIS and other cooperative research centers is intended as seed money, with the centers expected to gradually become fully supported by university, industry, state, and/or other non-NSF sponsors. To date, more than 80% of the centers established under the program continue on as successful centers without NSF funding.